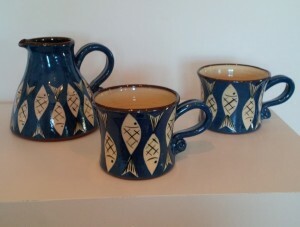 Rosemary talks to The Harbour Gallery about her love for pottery and the fun she finds in her profession! RJ: I was fascinated by potters throwing pots on the wheel and wanted to have a go. When I moved to Devon over 20 years ago I started an evening class and things progressed from there. After filling the house with pottery equipment and finally moving into the shed I started selling my work and became “professional” when my youngest child started school 6 years ago. RJ: Just watching a competent potter throw a pot caught my imagination and I had to try it. The possibilities with clay are endless. RJ: I’m inspired by nature but in a simple, humourous way. RJ: My pots needed to be functional but I want them to be interesting to look at and fun to use. RJ: I have developed the forms of my pots, using interesting shapes and styles as my throwing ability has become more confident. I love the simplicity of folk art and particularly love the traditional pottery of North Devon, with its generous form and simple country decoration. RJ: Potting involves a series of small steps which need to be done when the clay has the right moisture content. Just keeping the processes going can be challenging especially with the British weather…too hot and pieces dry out in a flash, too wet and cold and things can take weeks to dry. I’m also very constricted by space at the moment. RJ: I’m interested in trying some simple tableware made from stoneware. There are some excellent Japanese potters making very elegant, stylish pots which I’m drawn to. Quite a change from my usual wares.